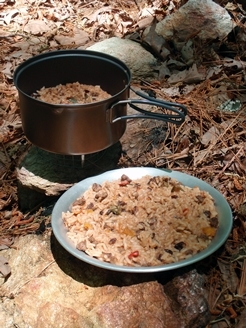 This backpacking recipe spices up your evening meal with a cheddar cheese sauce and taco seasoning. The sign might say Mount Rogers, but you’ll be thinking Margaritaville when you lift the lid on Señor Glenn’s Mexican Beef & Rice. Extremadamente delicioso! Cheese Mix: The cheese mix for this backpacking recipe can be borrowed from a six ounce box of Back to Nature brand Spirals & White Cheddar Dinner or Annie’s Homegrown brand Bunny Pasta & Cheese. Look in the health foods section of your grocery store. These brands have no artificial preservatives, flavors, or colors. The cheese mix packet inside the box can be divided into three servings approximately 1 Tbsp + 1 tsp each. Use one third of the packet for this recipe and save the rest for other recipes. The macaroni can be saved for other meals as well. You could settle for the Kraft brand if you don’t mind a little artificial coloring. Instant Dry Milk: I use Nestle Nido brand instant whole dry milk instead of the easier to find instant low fat milk varieties. The extra calories from the higher fat content in whole milk provide more energy for my long distance backpacking trips and I like the taste. Taco Seasoning: Use store-bought packets of taco seasoning or make your own by combining 1 Tbsp Chili Powder, 1½ tsp Ground Cumin, ¼ Garlic Powder, ¼ tsp Crushed Red Pepper, ¼ tsp Dried Oregano, ¼ tsp Salt. Makes 5½ teaspoons. You only need a teaspoon for this recipe, but you can add more if you like it extra spicy. Taco Mac: If you want to make another tasty backpacking meal with taco seasoning, try Taco Mac & Cheese. For information about dehydrating ground beef and vegetables for this recipe, review the dehydrating meat or dehydrating vegetables pages. 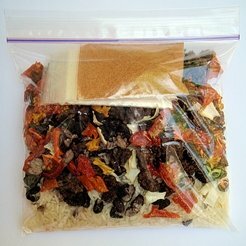 Combine and pack cheese, milk, and taco powders in small plastic bags. Enclose with other ingredients in a larger plastic bag. Combine all ingredients except cheese, milk, and taco powders with water in pot and soak five minutes. Light stove, bring to boil, and cook for one more minute. Remove from stove, stir in cheese, milk, and taco powders. Insulate pot and wait ten minutes. Mexican Beef & Rice can be spooned onto a tortilla and rolled up like a burrito. Add some slices of cheese if you carry it. This recipe will easily fill two burritos. Messy but tasty! 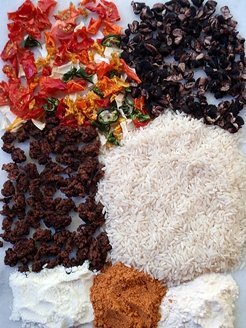 If you have some tortilla chips handy, scoop your meal out of the pot with chips or crumble chips over your Mexican Beef & Rice.